Back then, I was totally in my head and wondering why this woman was getting so excited about a crisp! And I replied with something like “don’t you normally eat crisps then?” to which she replied very kindly “yes, I do”, smiled and moved on to chat with someone else. I just didn’t understand why someone who eats crisps regularly could get so excited about eating them. Fast forward to today and I totally get it. In fact, I can hear myself saying the same sort of things to my kids and they look at me as if I am strange! It wasn’t long ago I started to understand this “experiencing things for the first time over and over again”. It’s almost childlike and yet children seem to have the most fun in the world and are extremely creative. They also seem to have little care as to whether they succeed until they start learning about the importance of it at school or home. That’s when the innocence and willingness to explore beyond their “comfort zones” seems to start waning. 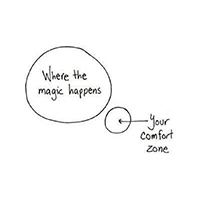 So what is the true definition of this thing we hear called the “comfort zone”? It’s a metaphor for everything we know or think we know. Everything we think we know to be true gives us the feelings of certainty and safety hence the term, comfort zone. Everything we want and could know is outside of that space. The freshness of life lies outside of this comfort zone. The infinite formless power that creates everything is available to us in the metaphorical space that lies outside of that miniscule comfort zone of what I know and what I think I know! Yessss! So going back to my crisp story …….. I see now that when I heard the organizer voice her excitement about the crisp, I was living in “what I know” about crisps. I was re-living the same old story of crisps (my comfort zone) and not appreciating the freshness of life available to me every moment of the day. Imagine that! I was forgetting the gift of life every moment of the day and just seeing through the glasses of “I know”. You may recognize yourself here (wink, wink)? Now I want to clarify something before I continue. I absolutely don’t see the miracle of life in every moment of everyday – I would be lying to you if I said I did, but I am very, very grateful for the moments when I do and to have the experience of it and know it’s available to me at any given moment, just as it’s available to you at any given moment. It’s like being a child in a sweet shop! Delicious! Fun! Exciting! Full of possibility and opportunity! And that’s my point here. Life is full of possibility. Endless possibilities. It’s blindingly obvious when we insightfully see it! The infinite formless power is available to each and every one of us 24/7. All we need is the one thought that will show it to us. And that doesn’t live in the land of our comfort zone if we haven’t seen it yet and we can’t conjure it up either. When we are willing to recognize that “I know” is blocking us and keeping us in our comfort zone, the world can look like a very different place. And once the world looks different, we tend to show up differently and opportunities that were always there become visible to us. All this because we took off the metaphorical glasses of the “I know”. Try it. Play with it. Test it out. Don’t take my word for it. I’d love to hear your experience of playing in the “unknown”. What do you feel? Drop me a line at sheela@sheelamasand.com or leave a comment on the blog.